Along with the dissolution of the Socialist Federal Republic of Yugoslavia in the early 1990s of the 20th century, the Self-Administered Interest Communities (SIZ) as a decades-long system of functioning and institutional way of solving housing issues and needs of the employees – Montenegrin citizens, collapsed as well. Prospect of the large number of Montenegrin employees for providing roof over their head was left on their own ability to cope with the situation and solve this fundamental and existential issue. Faced with the difficulties of transition, hyperinflation, disappearance of the huge market of SFRY, liquidation of majority of companies as well as the overall struggle for bare survival, the army of homeless and subtenants in Montenegro had no choice. Ways of solving this problem both on the institutional and legal level remained in the past. Surveys conducted in Montenegrin municipalities and trade unions showed that in that period of time around 20 to 30 thousand housing units were needed for solving housing issues. The Confederation of Trade Unions of Montenegro, faced with such reality, launched the campaign of initiation, intensification and carrying out of the renewed idea for the establishment of the Trade Union Fund for Housing Development. Having presented the idea to the bodies of the Confederation of Trade Unions of Montenegro, its constituents and members; the idea being the only possible way of solving housing policy of the employees in Montenegro, in 1996 the Fund for Financing Housing Development was established and by the year of 2002, it developed 101 housing units for members of the Fund in Podgorica. Housing development project is the first Project of the Fund for Financing Housing Development that was of the utmost social importance for Montenegro, while residential buildings developed in Kolasin, with 28 housing units and in Podgorica with 101 housing units, were sufficient reasons for the employees and companies in Montenegro to support this model of solving housing issues. The extreme interest, shown by numerous entities, starting from municipalities to legal persons and individuals, gave impulses for the extension of the Trade Union Fund for Solidarity Housing Development Project to – “The Project of 1000 Solidarity Dwellings”. 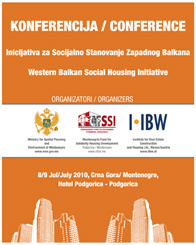 First of all, this initiative was launched due to the extremely adverse effects of the overall housing reform in Montenegro, with the purpose of providing solution to housing issues for those categories of population that could afford neither to buy apartments on the free market, nor to be beneficiaries of high interest rate credits. Namely, the aim was to solve housing issue and accommodation for at least 1000 families with the trend of increasing the number of housing units to 2000 and to provide young people with the opportunity to plan families and their future. The mode of financing this Project, which is why it is called the “Solidarity Project”, is covering 30 per cent by local governments through allocation of urban plots free of charge and exemption from utility costs, while the remaining funds are provided from the financial contribution calculated by applying 0.7 % to the sum of all gross salaries of the employees, which employers set aside and pay to the Fund. After the complaint, which certain individuals submitted to the Constitutional Court regarding compulsory funding that was defined by the General Collective Agreement and the Court’s judgment that setting aside 0.7 per cent from gross salaries of the employees is unconstitutional, the project of the Trade Union Fund faced stagnation. However, many institutions and companies continued paying financial contribution to the Fund on a voluntary basis, which enabled further activities of the Fund. Currently, around 1,500 institutions, organizations and companies in Montenegro participate in the Fund on a voluntary basis, such as: »MontenegroAirlines«, The Electric Power Company of Montenegro, Montenegro Post, Police Directorate, Clinical Center of Montenegro, Central Bank, » Electric Power Distribution« Podgorica, AtlasMont Bank, Pension and Disability Insurance Fund of Montenegro, UTIP »Crna Gora«, Brown Coal Mine »Berane«, Primary Health Care Center »Nika Labović« Berane, Mesopromet Bijelo Polje, Bepler-Jakobson Budva, Port of Bar, Ineks Zlatna obala, »Primorka« Bar, HTP Ulcinjska rivijera, Printing House »Obod« Cetinje, »Asom« Cetinje, Royal Theatre Cetinje, »Mirai« Nikšić, Hydropower Plant Perućica, General Hospital Nikšić, »Fjord« Kotor, Specialized Hospital »Vaso Ćuković« Risan, Thermal Power Plant Pljevlja, » Electric Power Distribution« Žabljak, »Boka« H.Novi, »Primorje« Tivat. The plans of the Trade Union Fund, which have been set ambitiously, through the support of local governments and allocation of free plots from the majority of Montenegrin municipalities, as well as demands of a large number of employees for solving their housing issues and at the same time the inability of the Confederation of Trade Unions of Montenegro to carry out planned activities independently, resulted in conclusion of the Agreement on Cooperation on the Development of Solidarity Apartments on 1st March 2007 between the Government of Montenegro, the Montenegrin Employers Federation and the Confederation of Trade Unions of Montenegro, which defined that the activities on the development should be fulfilled through the Trade Union Fund for Solidarity Housing Development, LLC. By the Agreement on 1st March 2007 the Company changed its name and founders, meaning that apart from the Confederation of Trade Unions of Montenegro and its Assembly, as the only founder and owner of the Fund, the Government of Montenegro, the Montenegrin Employers Federation, as well as other entities interested in carrying out these activities, shall be co-founders as well. By the Decision of the Government of Montenegro on the Accession to the Trade Union Fund in the capacity of member, as well as Decisions of the Assemblies of the MEF and the CTUM and the Decision of the Commercial Court on 11th November 2008, the tripartite company named “Montenegrin Fund for Solidarity Housing Development” was registered. The Montenegrin Fund for Solidarity Housing Development is thus the company, which, under favorable conditions and in cooperation with local governments-municipalities develops residential buildings for the needs of Montenegrin public institutions, organizations and companies, i.e. the employees at these companies in all Montenegrin municipalities, which financially contribute to the Fund on a voluntary basis. The Fund has carried out the construction of more than 1,000 housing units in several municipalities so far. 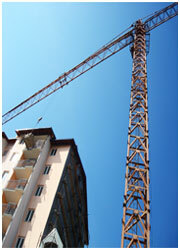 The construction of another 1,000 units in seven Montenegrin municipalities is planned as well or has already started. These results give us the right to intensify activities of the Fund, to additionally harmonize social conditions in Montenegro and to provide the citizens i.e. the employees with apartments under the most favorable conditions in Montenegro, with an average price of € 550-600 per m2. The Fund is managed by the Board of Directors, which consists of: Danilo Popović, President and representative of the Assembly of the CTUM, Chairman of the Board on behalf of the CTUM, Marko Čanović, Deputy Minister of the Ministry of Sustainable Development and Tourism, member of the Board on behalf of the Government of Montenegro, Ivan Mitrovic, President of the Assembly of the MEF, member of the Board on behalf of the Montenegrin Employers Federation and Boris Mihailovic, Executive Director of the Montenegrin Fund for Solidarity Housing Development. The headquarters of the Montenegrin Fund for Solidarity Housing Development is in Podgorica, at the address: Crnogorskih serdara bb. The company M-KABL LLT Podgorica has provided the tenants of buildings A8, A9 and A10 in Bar with a number of benefits for using cable TV and internet services as well as other services from their official offer. The foundation stone laying ceremony for the construction of residential building at the location of Tuski put, DUP Warehouse and Storage Zone in Podgorica was held today at 11 a.m.
Foundation stone for the construction of residential and commercial complex in Bijelo Polje has been laid. Completion of solidarity building construction in Rožaje. The Press Conference, organized on the occasion of the completion of housing construction that was carried out jointly by the Municipality of Budva and the Montenegrin Fund for Solidarity Housing Development (CFSSI), was held today in Budva. At the invitation of the National Social Housing Association (NSHA) of Armenia, the representative of the Montenegrin Fund for Solidarity Housing Development (CFSSI) – Mr. Boris Mihailovic, Executive Director attended the International Conference on Social Housing named „Partnership for Social Affordable Housing“, held on 21 and 22 March 2012 in Yerevan, Armenia. The Faculty of Architecture will draft a Rulebook of standards for designing and housing construction for the Montenegrin Fund for Solidarity Housing Development, which should enable quality construction of residential buildings adaptable to the needs of clients. This has been anticipated by the Agreement on business cooperation, which was entered into yesterday, by and between Mr. Goran Radovic, Dean of the Faculty of Architecture and Mr. Danilo Popovic, President of the Board of Directors of the Fund.